From frozen must be steamed in a steamer for 6-8 minutes or deep fried at 350°F for 4-6 minutes until internal temperature reaches 165ºF as measured by use of a thermometer. Due to its flavor versatility and health benefits, Edamame continues to be a much adopted ingredient. Recognizing today’s ever-changing sophisticated customer dining pallet, with growing emphasis for a healthier life style, Kabobs’ culinary team has paired the fresh flavors of edamame (soy bean), with a blend of vegetables, herbs and spices to create its Edamame Potsticker. 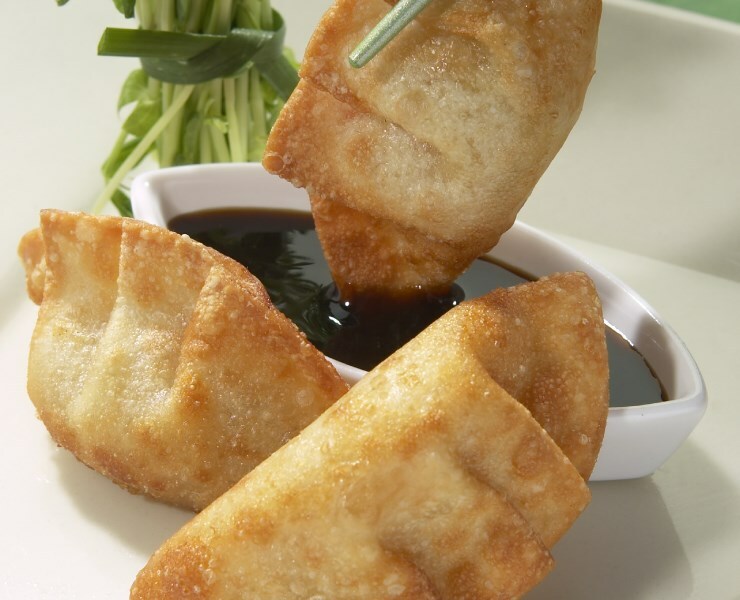 Perfect plain or with a ponzu or hoisin sauce, this Asian-inspired dim sum is great for a passed hors d’oeuvre / appetizer, placement in soups, or an accent to cold Asian salads. Perfect plain, or with a ponzu or hoisin sauce. Potsticker can also be used in soups or Asian salads. A large whole mushroom cap generously filled with a spicy, Italian sausage stuffing.